A Welsh girl in Australia: Smelly Movies. Have you ever been to a 4D movie? but at least I knew what 3D was all about! Yesterday was a pupil free day at school, so Sibs had a few friends around to play. After a bit of a rainy morning we all set off to the movies for a 4D experience. Just in case you are also ignorant to the 4D concept let me enlighten you. - It's smelly movies! Or more accurately put - it's Aroma Scope. You get the rather fetching 3D glasses to wear and you are also given a scratch and sniff card. 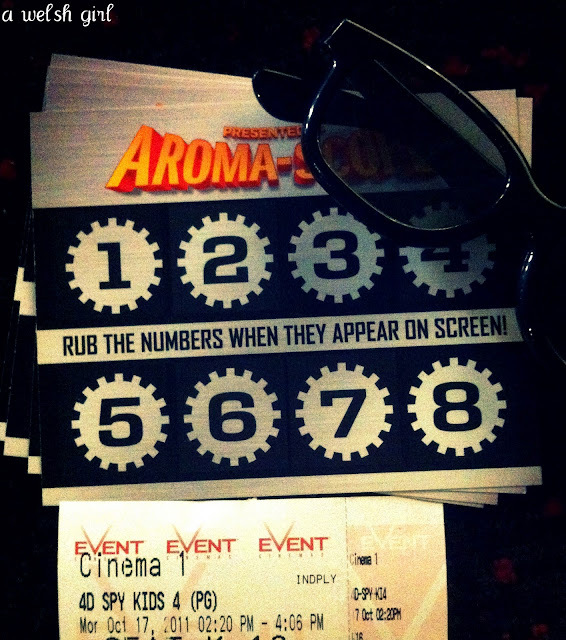 When the number appears on the screen you have to scratch and the aroma matches the scene. Now this was a kids movie - 'Spy Kids 4', so you can image the kinds of smells that we got....baby nappies, farts, blue cheese bombs(?). Yes, it was all there for you to enjoy the full cinematic experience. The girls giggled throughout and there was great anticipation as to what the next smell was going to be. 'Spy Kids 4' is a typical kids film - plenty of action, cute kids, cuter dog, good messages. However the topic of conversation in the car on the way home was all about the smells! 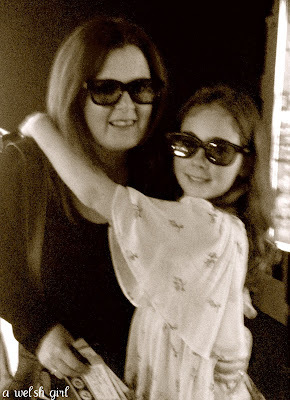 looking groovy in the 3D specks! We wondered what would be next? Will we get seats that move with the action? Will the smells get released into the cinema? ...It's probably happening already isn't it? There are occasions where I am truly glad that I can't smell what is on screen! Oh my goodness what will they think of next??? I havent even been to a 3D movie yet and had never heard of 4D - I'll ask my 16 yr old tonight, maybe it hasnt hit our shores yet!! Sounds great fun for the children though! Wow Beth this is a new one for me, really cool technology! Glad to find your site! We've never done 4D but I am tempted to give it a go if I ever see it advertised near us!